This easy chicken alfredo recipe is perfect for an easy meal the whole family will enjoy. 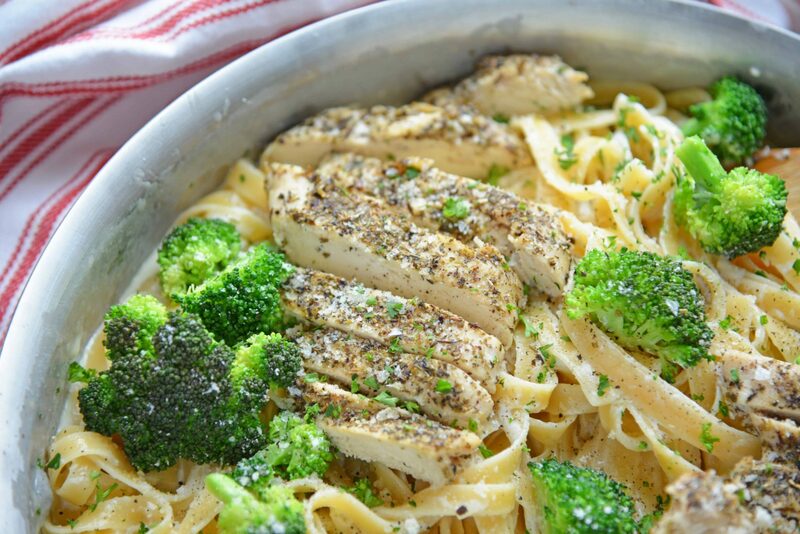 Broccoli Chicken Alfredo is a quick and easy weeknight meal using pasta, a creamy parmesan alfredo sauce and tender marinated chicken breast. Alfredo sauce is considered to be one of the most popular Italian sauces… in the United States. However, you won’t really see Alfredo sauce in Italy. It is very much an American-Italian comfort food thing. Historically speaking, Alfredo sauce did originate in Italy by a man named Alfredo di Lelio, Alfredo owned a restaurant in Rome. Rumor has it that he was trying to make a dish for his pregnant wife and made her buttered noodles tossed with Parmesan cheese. A dish that is still regularly seen on children’s menus. 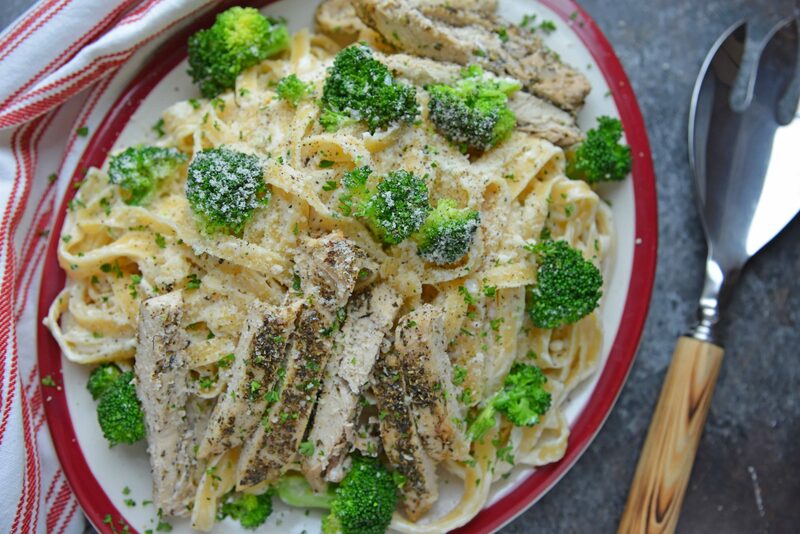 Later, Alfredo added the dish mixed with heavy cream, to his menu as the “house pasta”. He took it off the menu at one point, but people continued to request it. Today you will only find Fettuccine Alfredo on a handful of menus in Rome and no where outside of Rome. Regardless of where it comes from, it is delicious, so easy to make and a staple on nearly every Italian menu in the US. It is a wonder to me why anyone buys jarred Alfredo sauce. The most basic of Alfredo sauce recipes only consists of a handful of ingredients including butter, cream and Parmesan cheese. Very similar to cacio e pepe. 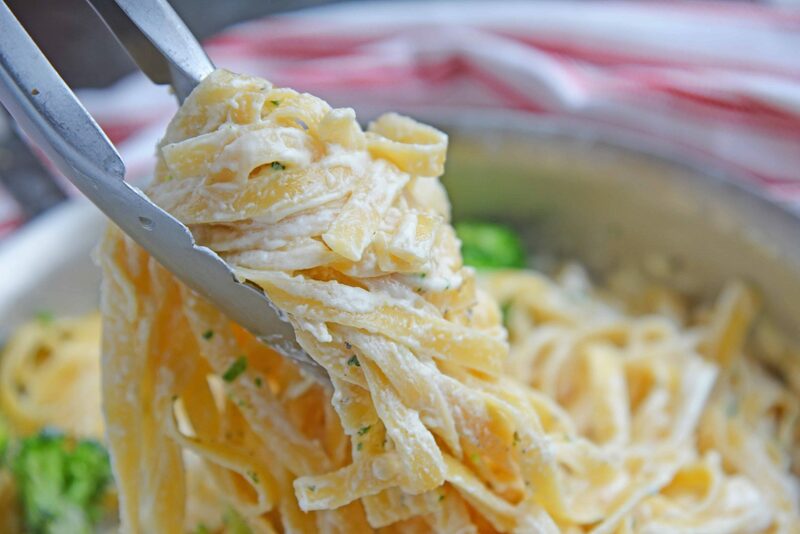 Two of the most popular ways to prepare alfredo sauce are with chicken and with fettuccine. In fact, on many Italian restaurants you’ll see the whole dish listed as Fettuccine Alfredo. 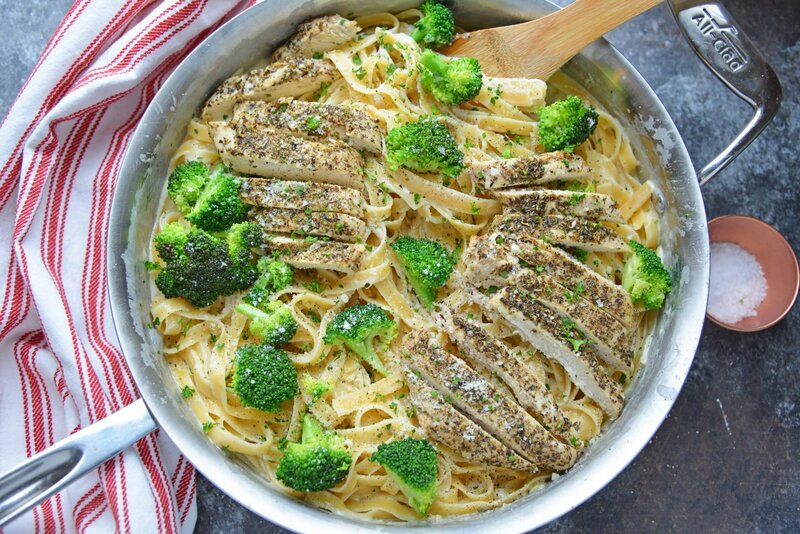 Really, Alfredo can be served with any pasta you’d like, I prefer linguine pasta. 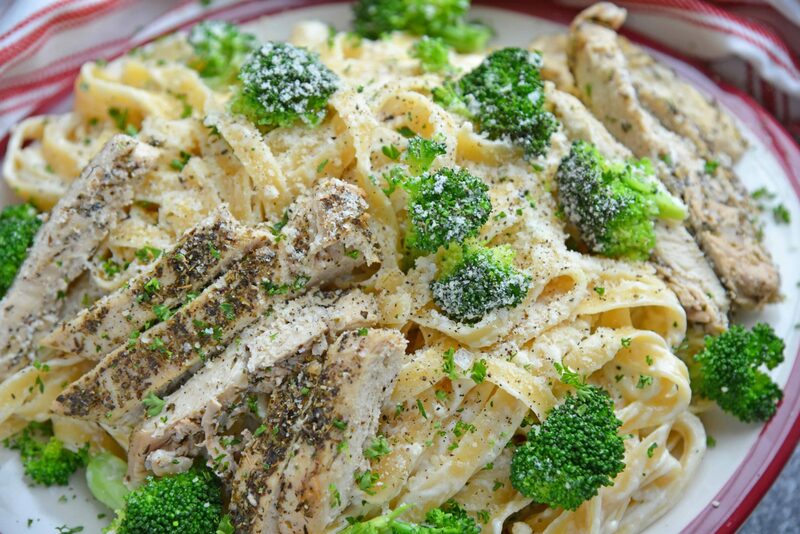 Even if Alfredo isn’t a popular Italian recipe, it is most commonly served with chicken because throughout most of Italy you won’t see any seafood item served with cheese or dairy. Shrimp, scallops and other seafood aren’t an option and beef and pork just don’t taste that great with this rich, imfulfied sauce. For the record… I love alfredo sauce with shrimp and scallops and don’t stick to the unwritten rule of no seafood with dairy. Just see my authentic carbonara post! My chicken is a little different than most chicken alfredo recipes. Why? Because I marinated my chicken in a very flavorful sauce that uses red wine vinegar, garlic, onion and Italian seasoning. PRO TIP: Tenderizing the chicken breaks apart fibers, allowing for the marinade to penetrate quickly and effectively. It also makes the chicken a uniform thickness so they cook evenly. You can marinate the chicken for s little as 2 hours, but up to over night. The longer it marinates, the more flavor it will have. It will actually take longer to make the chicken than the Alfredo sauce! From here you can customize your alfredo sauce with a variety of seasonings, spices and even more vegetables. 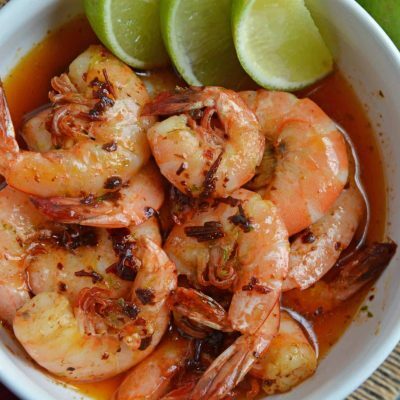 My favorite is using fresh herbs like minced oregano, basil or parsley or even crushed red pepper flakes. PRO TIP: The conversion for dried herbs to fresh herbs is 1 tablespoon of fresh herbs or every 1 teaspoon of dried herbs. Rub herbs together in your palms to release natural oils and boost flavor profile. In addition to broccoli, peas, roasted red pepper, caramelized onions and even cauliflower are great vegetable additions. Parmesan Cheese Grater– Another item I didn’t think I needed, but love. Parmesan cheese lasts longer and tastes better when freshly grated. PRO TIP- Freshly grated cheese works best in any sauce recipe because it can melt more easily than if it is incorporated in large chunks. Can I use a different type of pasta? Sure! In Italy Alfredo is made with fettuccine and mine is made with linguine. It is a heavy sauce, so I beleive it is best with a thicker pasta like tagliatella or even a stuffed pasta like tortellini. Penne and other tubed pastas are also popular. I would discourage against delicate or small pasta like angel hair. There are over 600 shapes of pasta out there; each with a purpose to be paired with a specific type of sauce. Do I have to use chicken? Nope. 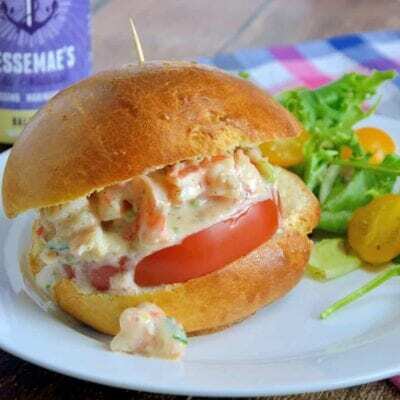 As referenced above, you can use seafood or shellfish too. 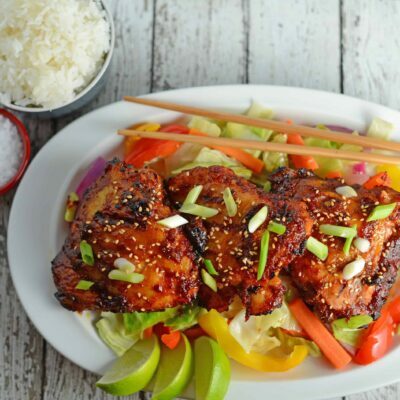 You can even use the same marinade. 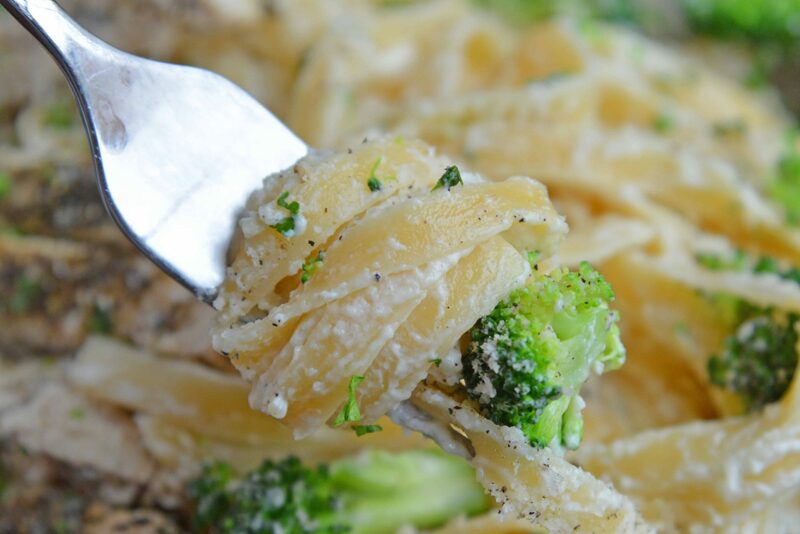 If you wish to make it a vegetarian alfredo, then just omit the meat altogether and you’ll have a broccoli alfredo! Can I freeze chicken alfredo? You can freeze Alfredo sauce in a an airtight plastic bag for 3-4 months, however I would not recommend freezing the pasta, chicken and sauce. What is the best way to reheat alfredo sauce? If heated too hot, alfredo sauce will seperate. Reheating it in the microwave often does that, so on stovetop is best. Add a small amount of cream or milk to thin the sauce a little, about 1 tablespoon will do. You can microwave it, but the texture will be a little off. Is alfredo sauce healthy? 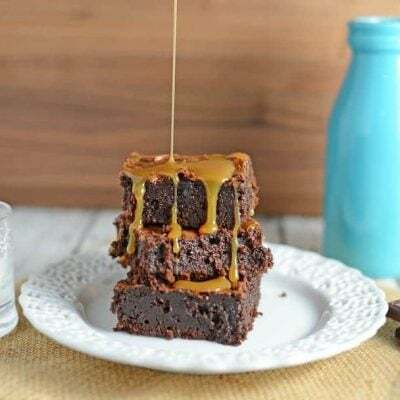 The definition of healthy is different for every person, however I think I can generally say that this is not a particularly healthy recipe and should be consumed in moderation. What goes with chicken alfredo? 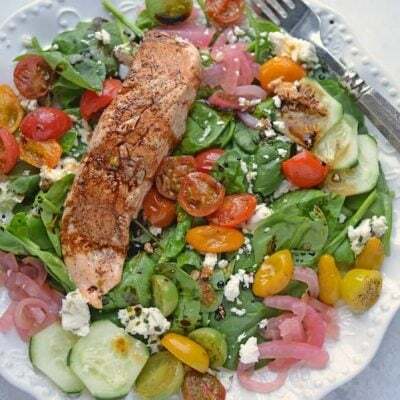 I usually just make this as a one-dish meal, but do serve a nice leafy green salad before the big dish of pasta. Tiramisu makes a lovely and light dessert. 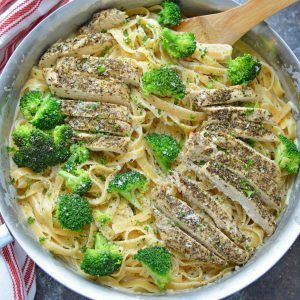 How do I make jerk or blackened chicken alfredo? 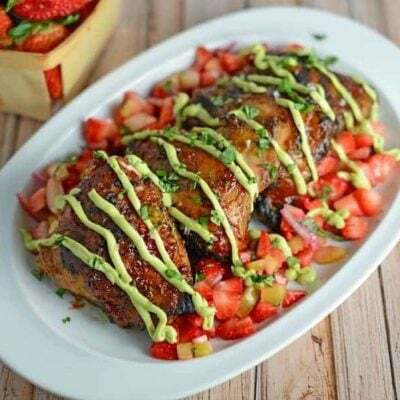 Omit the chicken marinade mentioned in the recipe and just use vegetable oil with a blackening seasoning or jerk seasoning. Cook the same way. What wine do I serve with chicken alfredo? Most people will tell you that chicken pairs with white wine, but I am here to tell you that you don’t have to conform to any rules! Check out my post on Wine Pairing 101– a guide for those of us who aren’t wine experts. What can I substitute for Parmesan cheese in alfredo sauce? Alfredo sauce is really characterized by grated Parmesan cheese, but if you must substitute something, I could try for a pecorino romano or another hard, white cheese. 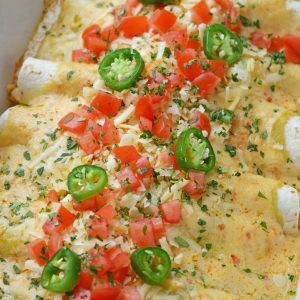 What can I substitute for cream in Alfredo sauce? Cream is really the best bet for alfredo sauce, but you can use half & half if you are in a pinch. I’ve tried using whole milk before, but it just wasn’t heavy enough. I ended up needing to use additional butter to thicken it up. 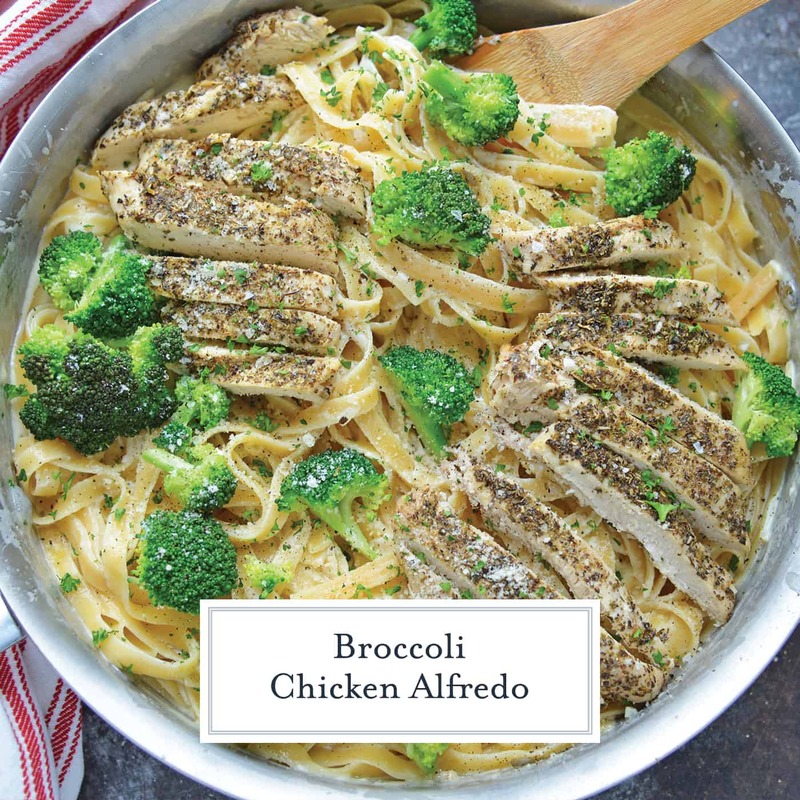 Broccoli Chicken Alfredo is a quick and easy weeknight meal using pasta, a creamy parmesan alfredo sauce and tender marinated chicken. 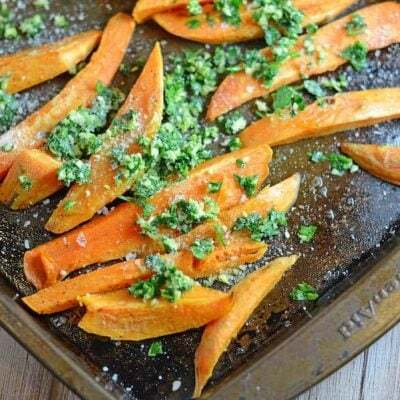 Combine Italian seasoning, vegetable oil, red wine vinegar, dried minced onions and garlic powder in a large airtight plastic bag. Using a meat tenderizer, pound chicken breasts until they are uniformly thin, about 1/2 inch thick. Cut into 2-3 smaller pieces. Marinate in plastic bag for 2-24 hours. When ready to serve, heat large skillet and coat with cooking spray. 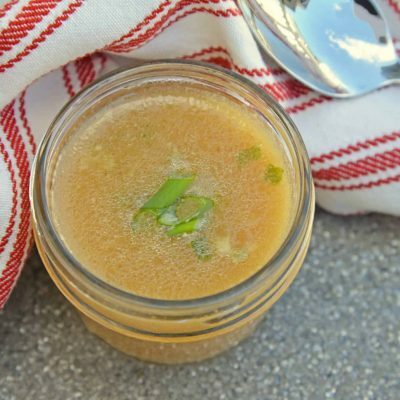 Remove chicken from marinade and discarding any leftover liquid. Add chicken to the skillet, cooking 4-5 minutes on each side or until fully cooked. 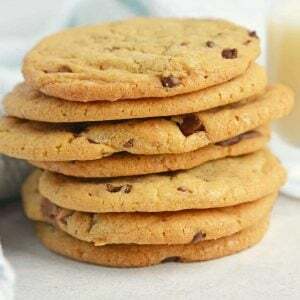 You might have to work in batches. Cut chicken against the grain into strips. Set aside while you make the sauce. Make sure pasta is cooked. It can be cooked ahead of time or in the same pot you intend to make the alfredo sauce. In a large pot (large enough to accommodate all of your pasta) melt butter. Add garlic, sauteing for 3 minutes. Stir in heavy cream and parmesan cheese, whisk until smooth. Add cooked broccoli florets, tossing to coat. Serve pasta in large pasta dishes, divide chicken evenly over pasta dishes. Garnish with freshly grated Parmesan cheese, Maldon sea salt and freshly ground pepper. *You can also steam the broccoli on the stovetop using a steamer basket or even boil it. I prefer to microwave it since this is a quick weeknight meal and I try to limit how many dishes I am making dirty. I love all the flavours in here, so delicious! What a beautiful dish! I love all of your helpful tips and suggestions at the end too. 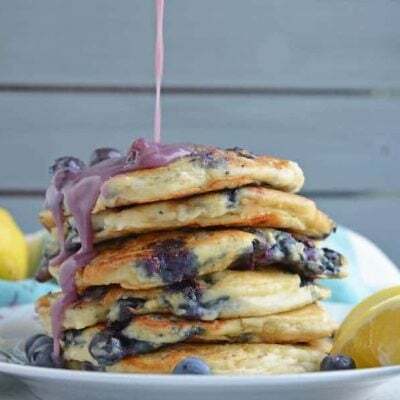 Looks like a yummy family-friendly meal! Love the addition of broccoli! I adore alfredo but sometimes it’s really nice to have something green to cut the richness. Totally excited over this dish!!! 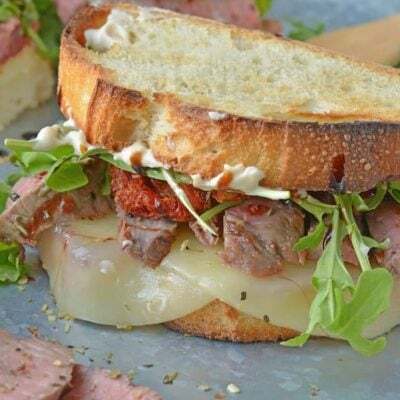 A classic recipe taken to a new level with that marinade and the creaminess of the Alfredo…can’t wait to dig right in! 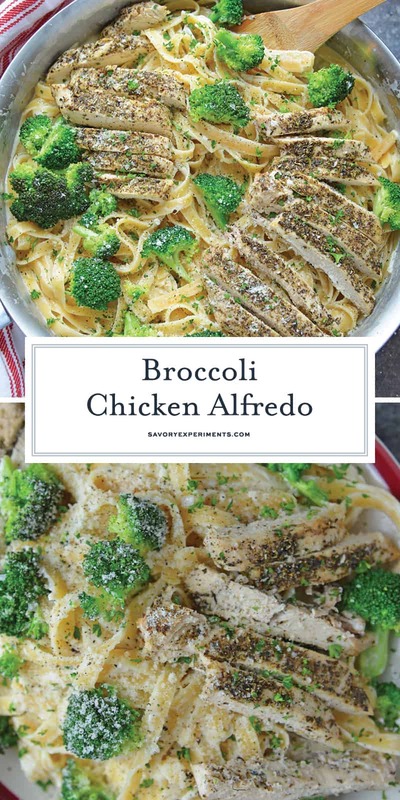 My girls love chicken alfredo and also like broccoli so this recipe is perfect for our family. Thanks for sharing!